Wow! Thanks to everyone for the votes and comments. A real surprise to win against such tough competition. As some dpc'ers noticed I have been spending time on boat subjects recently. This entailed being ready to shoot at 5 in the morning when the sea inside the reef was still mirror smooth and the sun was just starting to colour the horizon. I took this photograph close to the village of Mahebourg on east coast of Mauritius, close to where I live. I had two photographs which I had to choose from and was encouraged by family and friends to submit this one. * I levelled the horizon. * Used saturation to boost the purple and pink hues a little. * Adjusted curves and levels. * Applied dodging and burning to the clouds, rocks and boat; just enough to enhance the different tones. * I had to apply a little neat image because I shot at the wrong iso! What a gorgeous picture. I only wish I had seen this one in the challenge to vote on it. It would have surely been a 9 or 10.
speechless; just a great and interesting shot! I love this photo. Excellent in every way. I would love to visit Mauritius one day. My dream is to be able to take photographs like this one some day..! Congrats on your blue ribbon, great shot! Very Nice! I don't think I've seen anything quite as striking as the mystique this picture allures! Great job! This is an amazing image. I love the way the sky merges almost seamlessly with the water. Congratulations on your ribbon! It is a fantastic shot - I wish I had something like it near home. Great work!!! "A Tranquil Reflection" and your other image "A Perfect Day" are my two favorites images I have seen for a long time. I love the the way you use the camera. You have a true gift, and you must be very proud. Thank you for sharing your beautiful photography to the world. YOU ARE NOW MY FAVOURITE PHOTOGRAPHER. Incredible job Jean! What's even better is I know exactly where this is, lovely memories. Great job! well deserved blue! Deserving winner. Well done ! I can see why this placed #1. Excellent job. And I like the title. This is an awesome photo. Congratulations on your ribbon! This is an amazing shot! Love the calm feel I get when viewing it. Congrats on a well deserved 1st place ribbon! Happy Happy! Wonderful image, my highest pick in this challenge. Congrats! All I can say is wow. Excellent Work. Well derserved first place. Way to go, Jean! Congratulations! Jean, many, many congratulations! You rock!!!! Congratulations on your blue! VERY well done - especially in such an incredibly tough challenge. Amazing tranquility, well done! Congratulations.. Highly impressive floating like study. Congratulations on your blue. Mmmm, Free Study Blue, it's a thing to be coveted. Congrats! lovely! great work and congrats on the ribbon. Beautiful shot. Congratulations on top spot in this challenge with so many great shots. Your work is outstanding. You should feel on top of the world today! Wow. What an achievement. Congrats on the work of art. Anyone who gets up at 4 to get a 5am photo should win something! Well-deserved. You're great! A big congratulations for this graphic representation of such a lovely scene. Beautifully done Jean - congratulations!! Congrats Jean. This one has your signature on it. Congratulations ! Excellent shot ! You can't have a picture like this without describing where it was, the time of day, what post production effects you used, or changes to original. It's like giving someone a thousand dollar bill that has been bronzed, laminated, and put into one of those clear boxes that are solid. Extremely beautiful, well deserving of winning this challenge, I especially like the purple colour cast, very fitting for the shot. Going to my faves. Congrats!!! I knew this was yours!!! And your Best score ever! Message edited by author 2005-12-08 07:45:34. Really beautyfull, well deserved blue ribbon Jean!! Gorgeous, Jean! Big congrats on your win! I keep coming back to this image. the water is so eerily smooth. the reflections are top notch and i've bumped up your score from an 8 to a 10. I like that it's hard to tell where the sea ends and the sky begins. Did you have to edit it to suppress the horizon somehow? This has a nice abstract feel. I love it. Wonderful work...the horizon just disappears. Lighting is great. Looked at this one again. Bumped up. wow, if this doesn't rank right up there at the very top I'll be surprised. I love the way the reflection of the clouds makes it seem as it the boats are flying. Has a surrealistic element to it. Very nicely done. Ok, that's pretty amazing. So far, my pick for a ribbon. One small nit, the sky, at the upper left top, "looks" dodged and burned. I don't mind dodge and burn, but you shouldn't be able to tell. I tried looking hard to see if it's somehow natural, but I can't find the matchup in the reflection. One thing I would have considered if I were lucky enough for this capture to be mine: the foremost center rock to me is unharmonious with the other rocks. It's lighter, and smoother, and more of an attention stealer. I think a crop at the bottom to eliminate it, while losing a bit of lovely foreground, would have been better. What a great illusion! That boat looks as if it is floating in mid-air. I love the way you blended the sky and the water - the way you eliminated the horizon line. Bumping up - to top 15 in my choice. I like this a lot although I'm not sure if this would have been the best composition. No doubt you tried from all angles though! Cloucds look great. Very well framed and cropped. Nice and calm. A fine composition. Great reflections and subtle colors. This lovely images gives the illusion that the boats are floating in mid air. What quiet waters and what a superb reflection like no other i have seen. The light above sinks gently to the rocks in the foreground wherein we do a double take to ground our senses. Speak of an image that moves and then add this low key coloration! Wow! Bumping up. One of my favorites of all time. A 10! It`s really nice when you get still conditions that allow perfect reflections...gives a kind of "floaty" feel to the image. I`ve had a go at this kind of shot myself with some success. I really like the way the water merges with the clouds, really beautiful ... would love to see how what editing was involved. So peaceful and still. Really like this one. So dreamy ! Very delicate , one of my favs ! Excellent reflection shot. I can barely see the horizon. 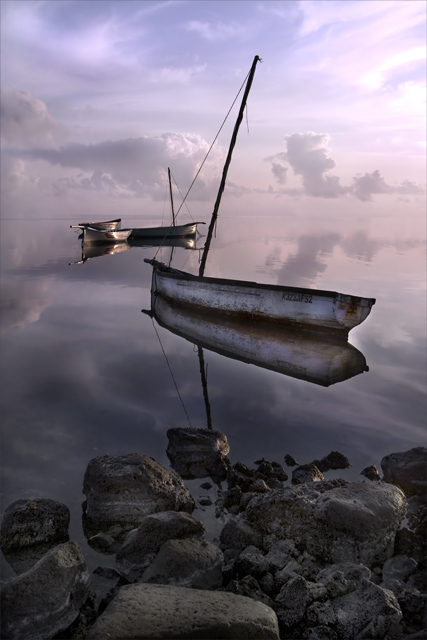 The boats look so deserted, Very nice picture. This looks like one of "Jean's" shots, very nice indeed. congrats in advance. 8 - Very nice. I like how the horizon has almost disappeared. Criticism; difficult, either a slight tweaking to bring out a little more subtle color, or even (maybe, and depending what was there/what you had to work with) a horizontal crop, really 'using' that 'vacant horizon', may have made this even better in my opinion. What you have created here is an incredible photo with beautiful lighting, excellent tonality and with a wonderful atmosphere. I love how the horizon line virtually disappears. My only critique would be that, IMO the composition would benefit from a slightly simpler elements. I would have excluded the boats in the background (although they are beautifully lit) leaving the solitary one as the principle subject. I realize that this could have been out your control. Outstanding work. This is just about perfect. A free study's a crapshoot, but this is a ribbon as far as I am concerned. I don't see how to improve it except possibly to burn the foreground in a tad. erasing the horizon (if that's what you have done) really makes this photo as there is a seamless transitin from sea to sky. The nearby stones feel a bit rescued in RAW but otherwise a fabulous shot. Beautiful! This looks like the "twin" to the picture in "Cheater". Love the soft purple-pinks. Amazing amazing amazing! The tones, detal and mood in this photograph is remarkable! My favorit in this challenge. The reflection is so clear of the boat AND the clouds that it almost looks like the boat is floating on the clouds. Beautiful! Stunning stillness of the water. Reflections and color tones are divine. Excellent. Dang, this is sweet. Great smoothness and clarity. Great job. Hmmm...I think I have seen these floating boats quite recently. Nice capture (again). Stunningly beautiful. This photograph excels in all categories and is a true work of art. I like the way you handled the horizon line, it makes the image very dreamlike. Nice use of subtle colors, one of the best. Like the composition and the reflection. Feels cold outside. Nice lighting. this is gorgeous, i have always wanted to find a scene like this. This is a beautiful shot. Great job. This is lovely beyond all my imagination. The words that come to mind are those of Forrest Gump: "I can't tell where the earth stops and Heaven begins." Brava and I surely expect to be seeing you finish in the top photos. Would love to get a shot like this. You have made it look so good. A very calm, serene, dreamy capture that the viewer justs gets totally lost and swept up in. One cannot tell where the sky begins and the lake ends. They blend in so seamlessly that one daydreams as one gazes upon the boats thinking, "Do they sail upon the waters or do they sail upon the clouds?" Wonderfully composed and captured. 10 from me. Gorgeous shot. Proudly hosted by Sargasso Networks. Current Server Time: 04/20/2019 07:13:57 PM EDT.